So, I’ve read the new Rob Bell book, ‘Love Wins’. Whispers round the tinterweb about it verge from refreshing and thought provoking to cries of heresy and outrage. Hmmm. What did I think? This book is beautiful. It’s poetic, thought provoking, sharp, cutting and warming. I don’t agree with it all, but I have a sneaky suspicion that Rob would be most unhappy for everyone to say ‘oh yes, you’re right about everything, I’ll change my mind and follow your thoughts from now on.’ 🙂 I reckon he wrote this for people to engage with the issues he writes about, to get deep into thought about it, to use our God given reason. So it is fine to not agree. But that doesn’t make him wrong, or me right. Who knows? The main issues he writes about in this book are ‘heaven, hell, God, Jesus, salvation and repentance.’ No small feat this one. And it’s not a long wordy theological tome in any sense of the word. Read it in your coffee break/in the loo/in bed. It’s engaging and pulls you in. One of his main points is about Hell. The traditional view has (sometimes) been something like this: ‘Unless you do not respond the right way, God will torture you forever, in Hell.’ What do we do with something like that? How do we understand hell? Rob talks about it like this: If God is so great, surely God gets what God wants, and what God wants is to be in relationship with every single person, ever. Surely we can’t say that God is not strong enough to do this? We narrow God by saying only a ‘few are saved’, he contends. Now, this is where the controversy comes in. Some may read his book and decide he is a Universalist, that all are saved, whatever they do and say, so what’s the point of believing anything or sharing it with your friends? I don’t know that he is saying that. He asks a lot of pointed questions, but doesn’t necessarily come up with nice neat little answers. I like that he leaves a lot unsaid, because it makes me think. I don’t know quite what I think really, but I’m with him on one thing. God is a God of power and justice, and ‘not willing that any should perish’, so we don’t need to narrow God down. Who knows how it all works? Sometimes, all we need to know is that God is just and is Love. Hell – burning for eternity? Somehow, I think not. <ducks eggs and cries of ‘burn the heretic!’> What I do know is that God created each and every one of us, we all bear God’s image, and God longs to know us and be known. 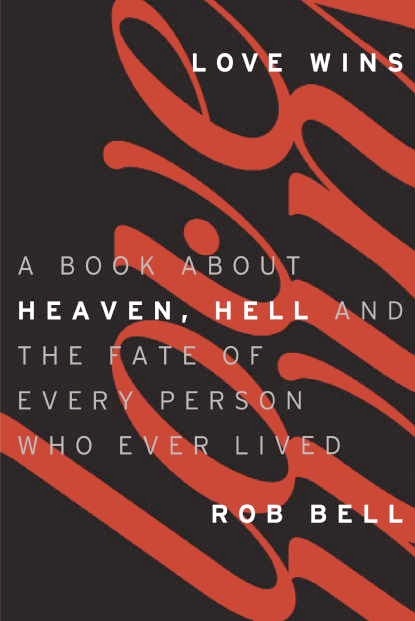 Rob Bell makes a big thing of how God sent Christ so that could happen. Atonement theories aside <resists temptation to go all theological on you> Jesus coming means that Love Wins. Has won. What could be a more positive message? I’m going to end with his last paragraph, ‘cos it’s Cool. I can't wait to read it actually. Love is the greatest thing and if God is Love, then Love indeed wins! Yay!